The current puzzle count is 415 (I think we have been over-counting a little recently; this is a more-accurate count). In case you missed it, I did a live Q&A with Chris Hecker of Spy Party today on Kotaku. In terms of world-building, lately Luis, Shannon, Eric and Orsi been doing a few things: (1) revisiting the most complicated areas in the game and making them playable with something resembling shipping art assets [until now they were playable only with placeholder pieces]; (2) starting to figure out what the game will look like, outdoor-wise; (3) stuff I can't spoil in a post like this. On the tech side Ignacio is working on optimizing the game, as often. A big part of this has been working on the mesh LOD system, but he's also looking at performance issues related to specific subsystems like grass rendering. Salvador has done a bunch of work on asset streaming, which seems to be pretty solid so far. Andy made a number of improvements to the collision system and audio system, and has now started work on an OpenGL port of the rendering, which, when done, is a big foothold toward portability to other platforms besides Windows. The audio guys, Andrew and Geoff, have done some really nice stuff in terms of sound. The audio aesthetic for the game is starting to come together. We have lots of rad footsteps and are doing some very interesting things in terms of environment sounds. This is not a comprehensive account of everything everyone's been doing; it is just what leaps to mind! Sounds like you’re making good progress, I look forward to experiencing the world of The Witness! I wanted to thank you for the wonderful talks you’ve given on game design and development. You tend to receive a lot of negative comments on the internet, it is my hope that by expressing how much I appreciate your work I can tip the scales in a more positive direction. As a beginner game designer/developer and a very philosophical individual I found that the design methodology you’ve described in some of your talks (searching for and highlighting truths) is the most honest, meaningful way to design/develop games. I get quite depressed when I think about the lack of philosophical thought in our chosen field, and so it is both exciting and inspiring for me to see the work you’re doing in the space. As a side note, would you by any chance know of a good mailing list, forum, or other online place for the serious discussion of game design? I live in CT where there are very few game developers, and am looking for a place to engage in deep intellectual discussions on game design. Seeing the evolution of the island over the months has me wonder what kind of attention (if any) has been paid to having the island itself look recognizable. Other games that feature onscreen characters of a unique design may not need this, and are probably rarely identified by their overall landscape. In your case, up-close screenshots that include the panels may help some folks realize “oh, that’s from The Witness”. Have you considered if, for instance from a distance, more than that is desired? Can’t wait to experience this for myself. Oh, and happy 4th. No, because I am designing for user experience, not for marketing. There is just way too much more-important stuff to be thinking about. Geoff? How common is that name? Not anyone who previously worked in downtown, Cincinnati, is he? Didn’t see anything about him on the about page. 400+ puzzles. More than Super Meat Boy now. Less than Spelunky! I was curious if you had played any of the Journeyman Project Games. The reason I asked is I think they were cool adventure games for their time but no one I know really played them and you seem to have a broad knowledge of games. I believe the original even predates Myst and was the first game I ever saw with 3d rending slides. They were also cool because each game in the series tried to innovative with pre rendered movies or walking and Quicktime VR type panoramas instead of just copying the Myst slide navigation. Even though the question is for Jon, I feel compelled to comment. I loved the Journeyman games growing up. The first one I played was Journeyman Project: Turbo. I think it did a really good job immersing the player in its world. I spent a lot of time with the game just looking around and trying to find new things. I also played the second and third Journeyman games, but they didn’t appeal to me as much. Another game I really enjoyed was The Neverhood. Oh man. After searching everywhere, I finally tracked down a copy of Journeyman Project: Turbo. I got an old copy of Windows up and running and installed the game. I run it. Ecstatic. My skin crawled upon hearing the intro. Turned out to be a Russian translation. The Neverhood is a great game. Jonathan, you should check it out, if you have time. (That damn Hall of Records). Looking forward to The Witness! Good luck with the rest of development to you and your team. I never played these games (but I remember from back in the day that they existed). There’s an automated system in the game that counts things, but it was counting some invisible duplicates of areas that were floating around in the game world, for editing purposes. That said, it is still probably overcounting by about 20 or so. But hey, whatever. The game is looking amazing at the moment and I’m glad to hear that you guys are making significant progress with it. I have two questions, one regarding the Witness, and one about game design in general. 1) I’ve noticed the puzzle count growing and I was wondering what type of puzzles these are? I’ve seen the videos of the maze puzzles and I was wondering what other type of puzzles you are implementing and if there is a theme. For example, I saw that in Braid, all the puzzles had to do with the manipulation of time and all the derivatives of this mechanic. Is there a similar exploration of abilities or themes in the Witness? 2) I have been following your opinions on game design via lectures on YouTube and blog posts and feel that these have helped me a lot when it comes to designing my own game. Yesterday I graduated with a degree in Computer Games Development and, in hindsight, noticed that the course was very industry focussed with very little emphasis on indie development. I now have the enjoyable task of applying what I have learned in an independent sense and am trying to do so by developing my own game and seeing where it takes me. I have been working for the past two months and believe that I have an idea that I want to see through to the end. I am currently using Unity to build this project and I was wondering what your opinion is towards the use of these types of game engines/tools? I am slightly torn between the notion that I may be using an engine not 100% specifically tailored to the needs of the project and the idea that I am very fast at using these types of tools to produce my desired results. Time is a resource I am looking to monitor heavily as this project consists of just me at the moment and I don’t want to spend too long on any one particular element (shades of your lecture at CSUA regarding “life taken per application developed” spring to mind). Good luck with the Witness. I look forward to playing the game in the future and wish you every success. Wow. Every picture I see from this game fills me with excitement. Can’t wait to play this one. I’m a very aesthetically interested person and the design in The Witness is awesome. I wanna be there now and get lost in the puzzles. I think the island really gives of this mystery/weird/not-knowing-anything-vibe. It also reminds me of the Myst games. Keep it up and take your time. I know this will be worth the wait. Hi Jonathan, sorry to comment on an unrelated topic but I just wanted to say I really enjoyed reading your “rant” on Intractability(no comment system there). Are you also an INTP(myers-briggs)? You definitely seem to fit the personality type, and also Braid feels like a game that came from an INTP mind. In the (very unlikely) case that you guys need some random inspiration on outdoor rendering and procedural generation, check out this blog: http://procworld.blogspot.com/2012/05/video-of-forest.html . Don’t know how well his techniques will scale to current consoles. I wish you the best of luck – I’m looking forward to play another great game! 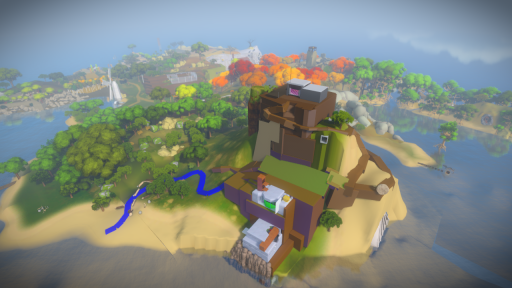 Firstly The Witness looks like it is coming along nicely, looking forward to playing it. Secondly, I was just wondering what types of reading material/Websites/References you would recommend for someone interested in Independent Game Development. I am currently studying an Advanced Diploma in Games Programming (using C++ in Visual Studio) and am looking for some great material to help me to learn more in my own time and not just during my time at my course. I don’t really have recommendations here besides to just go with whatever references you find appealing and to start making stuff. I learned long enough ago that the way I learned is no longer applicable. Thanks for the quick response Jonathan, I just thought I’d ask one more question. I’m sure you’ve noticed the “Ouya” device currently on Kickstarter, what is your opinion of this, do you think it will succeed and is it something you would consider developing for in the future? The game looks good and I hope it will be as good as and if not better than braid. I read your Braid bloog about how you were developing it and what resources you used. And you wrote that you used Visual Stuido(c++) and how you wished not to. Could you please explain this ‘couse it realy concerns me. I’ve been workiing with visual studio for four years and I still don’t have any problems with it. I’m not a pro (still learning) and I would like to know your opinion on this subject. I don’t remember that particular article, so I am not sure what I said; probably it’s from 4 years ago or more! But the main thing that comes to mind right now is that Visual Studio is embarrassingly slow at compiling code. What’s weird is that other compilers (gcc, etc) are even slower. A big part of the reason is that C++ is just a very complicated and ugly language, so a lot of effort probably goes into just making C++ work, which leaves very little ability to make it fast. But also, some things about C++ are inherently super-slow in terms of compile time (e.g. the way that templates work). One more thing. I agree with you about c++ being complicated and in a way “ugly”. Perhaps C# and XNA. I read somewhere thateven FEZ was developed using XNA. I’m not trying to teach you how to do this(since I haven’t realy done anything yet). I’m just trying to figure some thing concerning the subject. I ‘m more of c++ coder myself but I have been working on some projects where .net and c# were needed. And as far as I can see it c# is much more readable(compared with c++) + .net framework gives ‘a lot of space for creativity'(though it’s not crossplatform so I guess that is the main reason you haven’t choosed it). Well now, won’t take any of your time. Because C#/XNA is pretty terrible for a lot of reasons. (Performance is one of the major reasons). C++ is an ugly language, but in terms of the realities of what an ambitious video game needs to do, it is really sort of the only choice right now, which is why almost all high-end games are written in C++. Part of this is just industry momentum (all the libraries you have to interface with are in C++) but part of it is not (the fact that it’s not a garbage-collected language, for example). man i wanna play this game so bad.